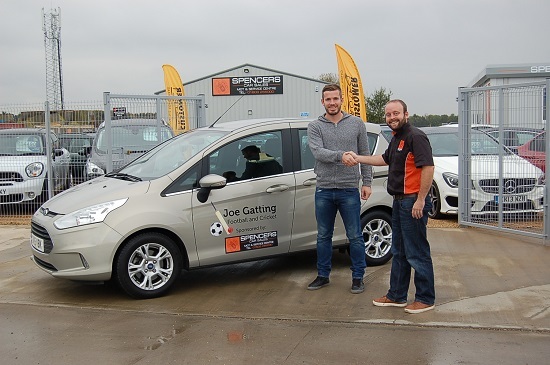 Spencer’s Car Sales and Service Centre is delighted to announce it has agreed to sponsor local sports star Joe Gatting. The son of former Brighton & Hove Albion defender Steve Gatting and nephew of former England cricket captain Mike Gatting, Joe was gifted with fantastic sporting genes and has played at professional level in both football and cricket. Joe graduated through the Brighton & Hove Albion football academy and made his first-team debut in 2006 at the age of 19. Chances to cement a place in the first team were few and far between, however, and in 2009 Joe opted to quit professional football and sign professional terms with Sussex County Cricket Club. Joe went on to play for Sussex for four seasons after scoring an impressive century on his debut, followed by one season at The Rose Bowl for Hampshire County Cricket Club. Since leaving the professional game, Joe has continued to play a key role at the highest level of local semi-professional sport, leading the attack for Dereham Town Football Club in 2016/17, who play in the Ryman League Division One North. In addition, Joe featured heavily as a batsman for reigning East Anglian Cricket Premier League champions Swardeston in the 2016 season, helping them to yet another title. In August, Joe was appointed Cricket Professional at Norwich School, imparting his years of experience at the highest level of the game on Norfolk’s most promising cricketing talent. Spencer Gray, director, Spencer’s Car Sales Ltd, said: “As a family run business with a wealth of knowledge and experience in the car industry, we’re really proud to put our money behind a local sportsman with equally impressive experience at the highest levels of his game.